The North Western Interlibrary Loan and Resource Sharing Conference at the Portland Community College–Sylvania campus this year had about 200 people; I was pleasantly surprised how big it was. I heard a lot of techniques and ideas that I want to think about some more. 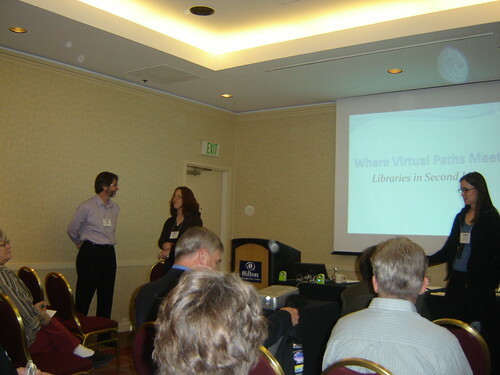 On Sept. 18, 2008 , Brenda Bailey-Hainer (CEO of BCR) and Gina Perschini (Networking Consultant of Idaho State Libraries) give us an interesting presentation about the Rethinking Resource Sharing initiative. Bookburro-like tool they are developing: GoGetter. I want to look into bookburro a little more. Unclear whether it is smart enough to look for any book or to look for just books on book vending sites like Amazon. Why are we not loaning media items? If it is because of their cost, we loan books that are more expensive all the time… Many libraries loan their media to other libraries, but there are some who still don’t. Others only loan to special consortia. One of the insightful challenges from the audience to this open-media concept that went unanswered was that their library does not loan media because the patron can rent it from Netflix or a local rental store for a lot less than we loan for. This is definitely true. Why is it harder to get a library card than to rent a car? I rented a vehicle for the conference and all I needed was my valid driver’s license and a credit card. For most public libraries, a new resident must provide a valid address as well as some kind of picture ID. For new move-ins, they usually don’t get any mail with their name on it for some time. They have to wait to get a card. The big question of the session: why can I rent a $20,000 car but I can’t borrow $100 worth of your used books without a local address? Why not charge alternative users (community, business, etc) instead of just refusing service? This one really is connected with the other two thoughts above. Instead of saying no, why not charge a fee and say yes? With new residents, why not take a valid credit card number instead of address verification? People give out their CC# all the time on the web, why should the library be any different? For interlibrary loaning media, could we not charge patrons a comparable price to rentals? delivery: email, delivery to their library or their home? Where are we with the GoGetter? Manifesto for Rethinking Resource Sharing: what do we think the user wants from us? if 600 libraries own it how many will actually loan it if it is A/V? when we cannot fill the request is the user referred back to the subject selector to find other avenues for finding the information or similar resources? if I was not a librarian, would I return? Brenda Comment: I can rent a car for $20000 with a credit card and a drivers license…but I can’t borrow $100 worth of books from my local library? 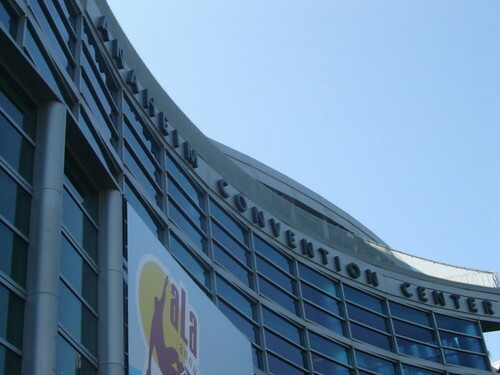 While at ALA I was able to go to the ACRL 101 session Saturday Morning. how do you choose what you do? 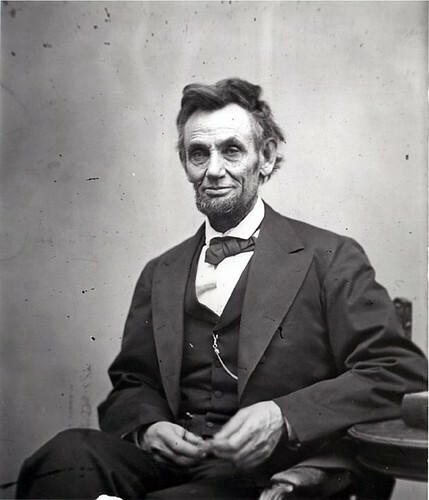 Samuel Wheeler at Lincoln Studies reports on a three-day program held by the Abraham Lincoln Presidential Library and Museum to mark the 150th anniversary of the Lincoln-Douglas debate and Lincoln’s House Divided speech. What a cool way to celebrate history in the library! 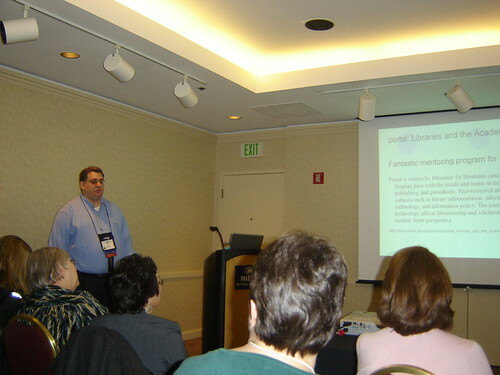 Peter Kraus, from the University of Utah Library, presented a fascinating discussion on how to start publishing in library science. Start with reviewing articles and grants; you can see over time what makes a good article/grant proposal to help you in your own future compositions. Look at the Journal of Library Philosophy and Practice–particularly welcoming to first-time writers. What do you mean I have to write? Do I even have something to say? You do have something to say—we all have a voice. What can happen if you get published? Elsevier = good to writers; bad to librarians—are you looking at this as a librarian or a writer? Q: reviews: do they provide a text they would like a review for? Or do you read something, compose and submit before you know if they want it? Steve Harris [Second Life avatar: Stolvano Barbosa] who blogs at Collections 2.0 and Susan MacMurdo [Librainian Infinity], both from Utah State University’s Library, presented a very interesting and well-attended session on Second Life and how libraries can use it to promote services and network with other librarians. How are libraries using it? Q: what do you need money for? Q: how can you make libraries in SL open but protect licensed content? Q: can someone edit your material after you create it? Q: how labor intensive was it? Q: is there any fraud or illegal factor in money here? Q: how long did it take to do this motion—dancing and clapping? Q: has anyone been caught for copyright violations? 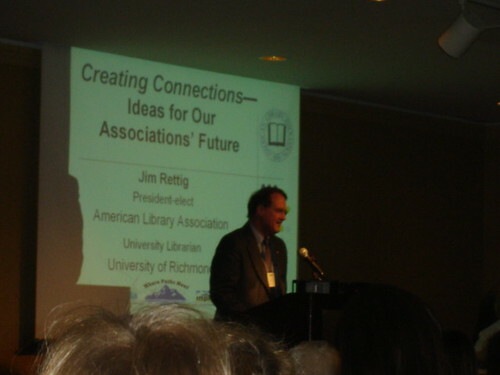 Rettig speaks about how he will be a champion this year for libraries in general; he feels that his main duty as ALA president will be library advocacy. He also spoke about librarianship as a profession and how we need to redefine our identity as librarians. YouTube questions for the Mid Winter Meeting; questions for the candidates: what do you want to do in the future? Midwinter meeting: we will be at the point where a new President of the United States will take the oath of office; the national archives have reclassified some documents some dating from WWII; we need to find someone who will prompt the government to be more open. I have always had a great response from students about the usefulness of instruction. Until our tools become as intuitive as Google, students and faculty can learn something new. Yes, my ego was a bit bruised, but I’m much more concerned with the messages that students are receiving from faculty about the useful/uselessness of librarians in the educational enterprise. This is a real issue. I have felt on more than one occasion that the students who come to library instruction a little less than excited to learn are in the sections with First-Year Writing instructors who think library instruction is a waste of time or even who are resentful that we take time away from their class; however, if we are not helping the isntructors’ students I can’t really blame them. For me the most effective library instruction sessions I’ve had or observed were those in which the librarian and the instructor met and discussed in detail what the learning outcomes were for the course as well as the instruction. Buy-in can be as simple as skipping a database that the instructor feels is less-effective. The other byproduct of those kinds of informal meetings with librarian and instructor is confidence: confidence in the librarian’s ability and in the value of library instruction. If the librarian shows a strong sense of capacity and professionalism in this pre-library instruction planning meeting, the FYW instructor is more likely to look forward to the instruction.